Please click on the below link to meet your PTO Officers and learn more about the RBT PTO. Please complete the form below to sign up to receive email updates from the RBT PTO. Sign Up For RBT PTO Email Updates! We declare this organization to be a safe listening space in which teachers and parents can come together to be heard and understood by each other, to increase our knowledge base, and to make mutual decisions which genuinely further our ultimate goal - the highest level of education for the students of Robert B. Turner Elementary School. 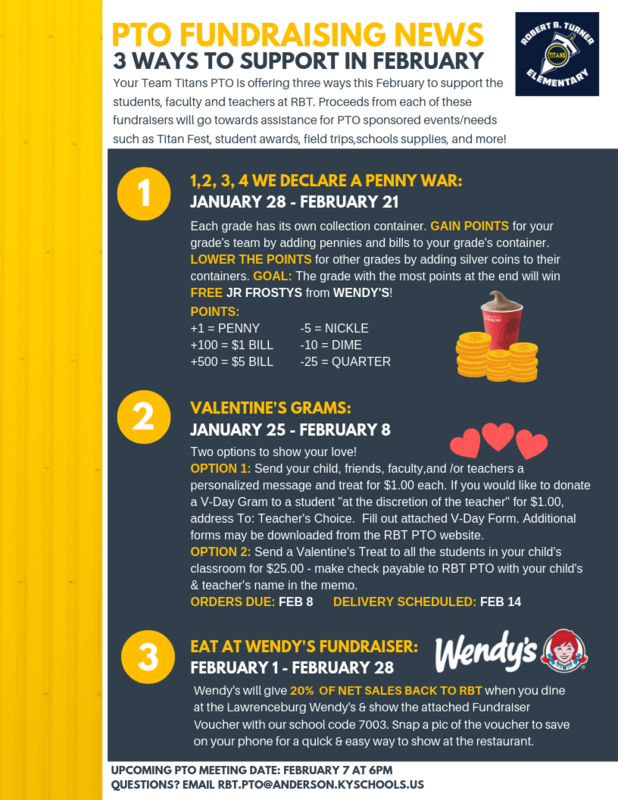 The RBT PTO has three fundraisers for the month of February. Please see the below flyer! 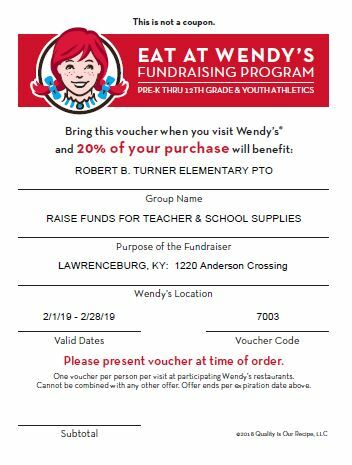 There will be a grade level penny war, Valentine Grams will be sold, and families that eat at Wendy's can earn 20% of their purchase for our school. We hope you will get involved and help our PTO raise some money to help our school. Questions? Email rbt.pto@anderson.kyschools.us. The RBT PTO will meet on the following dates at 6:00 p.m. in the RBT Library. If teachers, staff, and/or parents of Turner Elementary would like to request funds from the PTO, they must submit the below funds request form and read the funding guidelines below. Any comments or suggestions regarding the PTO Bylaws should be directed to Amy DeGarmo, PTO President. She can be reached at amy.degarmo@gmail.com.